New York, NY (November 14, 2016) – Dear Evan Hansen, the new musical with a book by Obie Award-winner Steven Levenson, score by Tony® Award nominees Benj Pasek & Justin Paul, and direction by 3-time Tony® Award nominee Michael Greif, begins performances on Broadway tonight, November 14, at the Music Box Theatre (239 W 45th St). Dear Evan Hansen will officially open on Sunday, December 4, 2016. Viewers can follow the behind-the-scenes action on the show’s official Periscope and Twitter channels, @DearEvanHansen, to see pre-show activity and interviews with the creative team, along with the premiere of the show’s new music video of “Only Us” (broadcast live at the exact time the song is being performed on stage), curtain call activity, and a special stage door moment with the cast following the show. This the first time a Broadway show will be able to grant this access to viewers around the world. It was also announced today that beginning December 6, 2016, Dear Evan Hansen will launch a digital lottery, which will allow users to enter the lottery for a chance to purchase specially-priced tickets to that day’s performance. The cast of Dear Evan Hansen includes Ben Platt, Laura Dreyfuss, Rachel Bay Jones, Jennifer Laura Thompson, Mike Faist, Michael Park, Will Roland and Kristolyn Lloyd, and Michael Lee Brown, Garrett Long, Olivia Puckett, Colton Ryan, and Asa Somers. A letter that was never meant to be seen, a lie that was never meant to be told, a life he never dreamed he could have. Evan Hansen is about to get the one thing he’s always wanted: a chance to finally fit in. Both deeply personal and profoundly contemporary, Dear Evan Hansen is a new American musical about life and the way we live it. Dear Evan Hansen had its world premiere at Arena Stage, Washington D.C. and played a record-breaking New York debut at Off-Broadway’s Second Stage. The musical recently won ‘Best Musical’ prizes from the Obie Awards, Outer Critics Circle Awards and Helen Hayes Awards. Dear Evan Hansen features scenic design by David Korins, projection design by Peter Nigrini, costume design by Emily Rebholz, lighting design by Japhy Weideman, sound design by Nevin Steinberg, and hair design by David Brian Brown. Music supervision, orchestrations and additional arrangements are by Alex Lacamoire. The music director is Ben Cohn. Vocal arrangements and additional arrangements are by Justin Paul. Danny Mefford is the choreographer. Casting is by Tara Rubin Casting, Lindsay Levine, CSA. Adrienne Campbell-Holt serves as Associate Director. Judith Schoenfeld will serve as Production Stage Manager, with Michael McGoff as Stage Manager. Dear Evan Hansen is produced on Broadway by Stacey Mindich, Mickey Liddell, Hunter Arnold, Caiola Productions, Double Gemini Productions, Fakston Productions, Roy Furman, Harris Karma Productions, On Your Marks Group, Darren Bagert, Roger & William Berlind, Bob Boyett, Colin Callender, Caitlin Clements, Freddy DeMann, Dante Di Loreto, Bonnie & Kenneth Feld, FickStern Productions, Eric & Marsi Gardiner, Robert Greenblatt, Jere Harris & Darren DeVerna, The John Gore Organization, Mike Kriak, Arielle Tepper Madover, David Mirvish, Eva Price, Zeilinger Productions, Adam Zotovich, Ambassador Theatre Group, Independent Presenters Network, and the Shubert Organization. Executive Producers are Wendy Orshan and Jeffrey M. Wilson. The show is also produced in association with Arena Stage, Molly Smith and Edgar Dobie, and Second Stage Theatre, Carole Rothman, and Casey Reitz. Jayne Hong and Rachel Weinstein are Associate Producers. 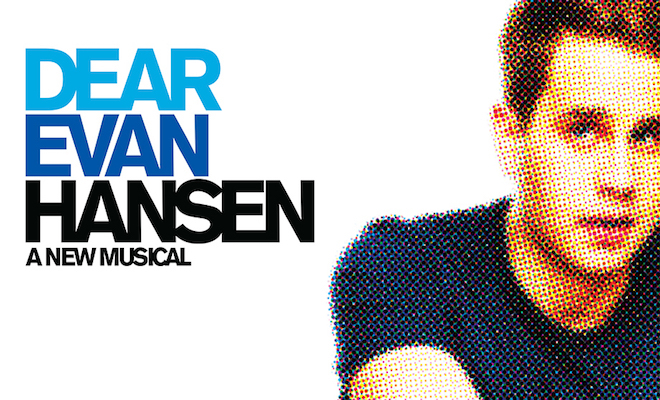 Tickets for Dear Evan Hansen (starting at $69) are available at the Music Box Theatre box office, on Telecharge.com, or by calling (212) 239-6200. For the complete performance schedule, please see www.dearevanhansen.com.